Intel Accounting and Business Advisors Inc. (Intel CPA) is a licensed Canadian Assurance (Audit, Review Engagement), Accounting (Notice-to-Reader Financial Statements) and Taxation firm with office in South Surrey, BC. The firm differentiates itself by providing client focused, personable and genuine customer care with emphasis on building long-lasting business relationship. They were a new company that wanted a secure client portal, a team member showcase and the site laid out in a way that would make it easy for their clients to navigate and find exactly what they are looking for. 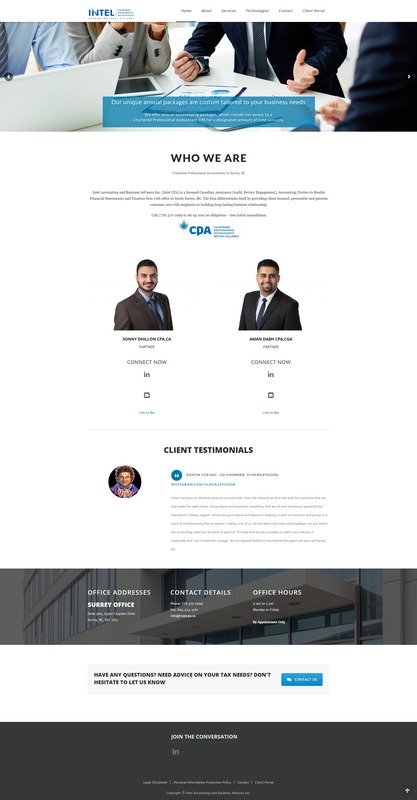 They also wanted to showcase client testimonials.